This Limited Edition Collection includes: A rigid chipboard box with specialty print, 6 art cards, and a 18" x 24" soft-touch poster! After waking up in a strange new world surrounded by people who can't remember who they are or where they came from, Haruhiro finds himself drafted into the service of the Volunteer Soldiers. Together with a ragtag party he must set out to make a name for himself in a world where magic and monsters are a part of everyday life. Special Features: OVA 2.5 - Staking Our Youths on the Bath Wall - One More Centimeter, Episode 4 Video Commentary, Trailers. So glad this is finally being released - this anime was absolutely beautiful, especially the way the background landscapes- feels like it was inspired by Miyazaki. Definitely worth supporting this anime - and everyone should has this on their shelf. A Miyazaki inspired other-world anime about a group of amnesiac teenagers who are forced to find their own path. Haruhiro, like the others, remembers nothing of his life before, except in small bursts that seem to come from nowhere. With this, he, along with Manato, forms a small group from the outcasts not selected by the other groups. Dark and melancholic, Grimgar does what few others do right when attempted. It refuses to become overly dramatic, and instead adopts a more refined and subtle approach that shows like SAO and Re:Zero seem to unable to replicate. A little slow-paced, but that just seemed to add to the charm. Characters: 5/5 This is where the show really shined. The interactions between Haruhiro and the other adventurers grows from mere acquaintances to comrades who defend the others to the death. Great show, great LE set! Recommend for any collector. And of course RightStuf is the best place to get it from. This is an action/adventure show in a fantasy setting that is all about the atmosphere and characters. It tells a complete, but not very remarkable story. But that is not a very negative issue because the characters are well developed. The art, animation and direction are very strong, and the soundtrack is outstanding. The series by itself is a 4 stars show, but Funimation's inclusion of a short OVA and a sturdy and well constructed chipboard box make it a 5 stars product. I already received my copy, and I am happy with my purchase. A beautiful collection that matches up well to the gorgeous art of the series. The art cards are not your usual postcards, being printed on card stock with graphic quality worthy of framing. The chipboard case is also of a higher standard usually seen in much pricier collections. The story itself is not your typical trapped in a fantasy world setting. The characters don't have any memory of where they came from or how they came to this D&D-esque world. Its a realistic life in a fantasy world. Characters spend time and money to learn jobs and skills as well as risk death to put food on the table. The story is slow-paced with character development and realistic action.Even the goblins seem to have personality. I say slow-paced but the 12 episodes pass in a blink of an eye. The story doesn't cover far, showing the characters going from amateurs to finally forming a decent party. This series is begging for a second season. There are a bunch of shows about being 'pulled into the fantasy game world'. Many are lackluster focusing on excessive and/or pointless battles but there are some great ones that focus on the fact it's a 'whole NEW world' and 'no longer a game' and those are the kind that entertain me. Grimgar is one of the later kind and perhaps even my favorite so far. The idea gets treated to a very 'realistic' approach. Adventuring for a living is a hard and dangerous business when you have bills to pay and death is forever, especially if you are a newbie in your chosen career. There are funny and heroic moments but there's a realistic weight and gravitas to the story and dialogue. The characters have a lot of depth and the VAs do a fantastic job bring them to life. It is also a extremely beautiful show with a lot of use of various lighting effects and some amazing 'water color' palates being used. I can't recommend this show to 'realistic' fantasy fans enough. I loved watching this show! 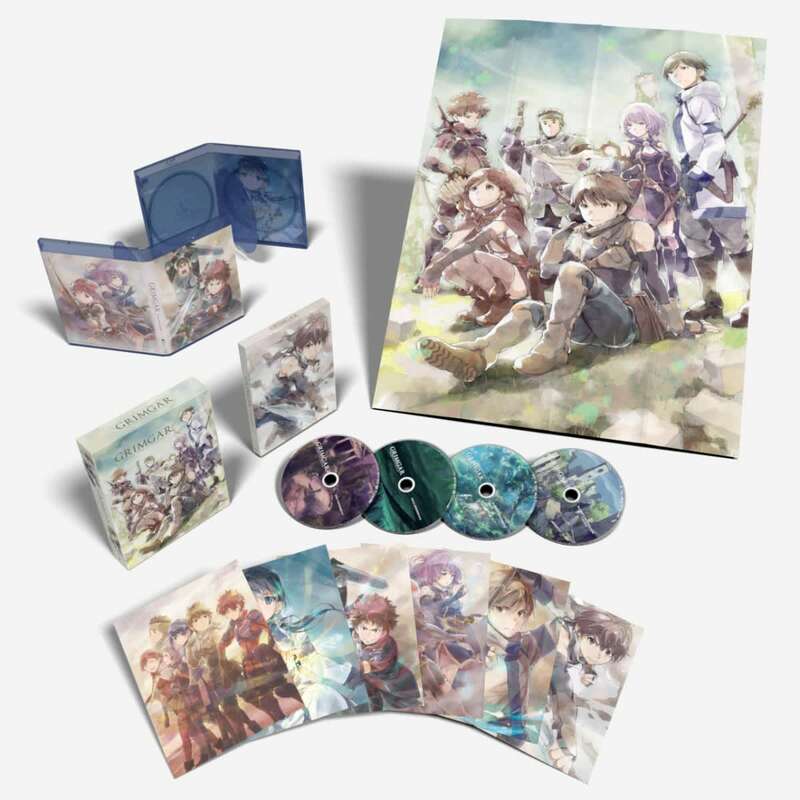 The artwork is very different from most other anime and Grimgar includes a story that I will not soon forget. I love how emotional this show made me and seeing the characters have the ability to pick themselves up after heartbreak was inspiring. As for the limited edition, I'd highly recommend it over just buying the regular blu-ray/ dvd. I'm glad that the chipboard art had a rigid feel to it because it goes along with the mood of this story. The package also includes a beautiful poster and 6 stunning, shiny art cards! This purchase was a great deal for me seeing as the limited edition blu-ray/ dvd was only $15 more than just the regular blu-ray/ dvd combo. Thank you so much RightStuf! Touching, Beautiful, Unforgettable. Grimgar is not to be missed. 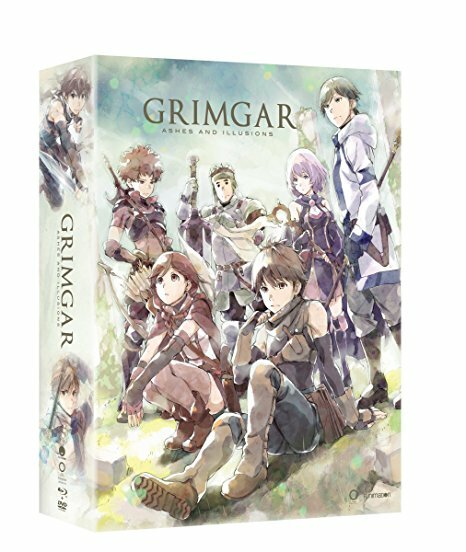 Upon reading a description of the series, one might dismiss Grimgar as simply another "people trapped in a Western style fantasy game setting", however this would be a tremendous mistake. Told thoughtfully and with lovely attention to detail, the series focuses little on how the characters arrived, treating us instead to excellent character development and interaction as this party on the fringe ekes out a meager existence in this painterly, watercolor world. Combat in Grimgar is a refreshingly serious and visceral affair, with real danger and risks to all involved. Enemies are, at times, surprisingly relatable, as well. I laughed and cried. I was truly fearful for the characters. Don't miss this gem. In this fantasy game world story most of the emphasis is on the character development but does include action when the characters find themselves fighting different creature races. This series finishes up in twelve episodes and one bonus episode, which can be watched either dubbed or subbed and unfortunately seems to go all too fast. Just like the main characters, we are left not knowing how or why these characters find themselves in a world where there is no replay, when any character dies, they don't come back. One hopes that they might add some more seasons as there is a lot of different aspects that could be developed further. Overall it was a good series, good plot, good music, graphics were well drawn and the voice acting on mark. For myself I opted for the limited edition. The artbox is solid and includes some nice art cards and definitely looks great with all the rest of my anime. I really liked this anime. It was a nitty-gritty fantasy that showed how normal people could become stronger... little by little. There were unexpected twists that really drove home the essence of the story and made even little victories so important.